In 2006, the Danish Ministry of Culture released the Cultural Canon of Denmark that lists, in separate categories, the best art works, films, architecture and design in the history of Denmark. In the category of art works, Astrid Noack’s ‘Standing Woman’ is listed, among only eleven other pieces, as one of the best in the history of the country. 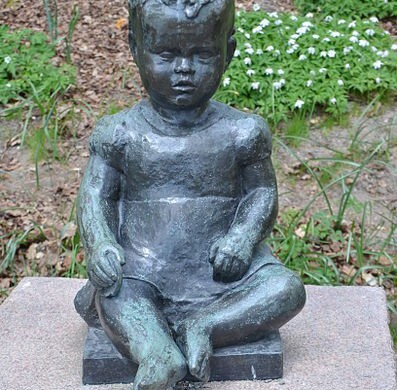 Noack was a noted Danish sculptor while she lived and, since her inclusion in the Culture Canon, there has been a resurgence of interest in her work. As a sculptor, Noack worked with several different materials. ‘Standing Woman’, for example, is carved from wood. Noack normally began her largely figurative sculptures by working with a live model and moulding the form in clay. The clay shape would be remade in plaster, where additional touches could be added, and later the piece could be finished in bronze. Her famous statue of the celebrated Danish painter, Anna Ancher, commissioned by the Skagens Museum, would have been created in this manner. Noack was born on 30 January 1888, the seventh child of a wealthy grocer. She was a friend of artists growing up, often sitting as a model for paintings and sculptures. At the age of 18, Noack began to study art and sculpture in earnest when she started at Vallekilde Højskole. There she was trained in how to sculpt and, especially, how to carve in wood. Noack thrived in this artistic community, living and working with other artists. Though she was often considered a lonely and strange figure during her lifetime, from Vallekilde onwards, Noack would take solace in being around communities of working artists. Following the end of World War One, Noack, like many other Danish artists at the time, left to make a life in Paris. The Paris art world held great influence on the work of artists in Denmark and other European locales. Passionate about creating her sculptures, Noack felt there was no better place to be than in the European cultural capital. Her life in Paris shaped her future in many ways. In Paris, Noack felt at home. She quickly became involved in the thriving community of artists and artisans. The business of life in the city inspired her creatively. But although she loved working there, her life in Paris was, unfortunately, full of hardship. It was in Paris that Noack became pregnant and gave birth to a son, Stefan. She faced the difficult role of life as a single mother with grace, happily raising her son. Tragically, little Stefan died aged 18 months old from measles. Noack was heartbroken. She stopped making art and for a while she lived as a tramp under a Paris bridge. Noack slowly came back to the world of art: firstly, working as a model, and then creating her own work at the Scandinavian art school in Paris at Maison Watteau. At the school, her distinctive style crystallised into the work of a mature artist. Her friends supported her as well, so that she was able to move through this tragic time and fully develop her talent. Noack stayed in Paris until 1929, when the global economic crash brought her back to Copenhagen. Noack soon found a working environment where she flourished in Denmark’s capital. In Copenhagen’s Outer Nørrebro neighbourhood on Rådmandsgade, she found an energy that reminded her of Paris.The neighbourhood was home to artisans and craftspeople of many trades, from smiths to saddle makers to photographers. The active quarter inspired Noack to produce her best and most celebrated sculptures. She moved her studio to an old horse stall at Rådmandsgade 34 in 1936 – a perfect place for Noack to work. The former horse stall was now one large room, which became both her studio and her home. A small, pot bellied stove heated and cooked her food, and a fold down bed served her for sleeping. Noack’s life was austere but it was not empty. For example, she always kept biscuits for the neighbourhood children. She was able to get the young ones to be still long enough to sculpt by doling out several servings of biscuits. Perhaps in memory of her own son, many of her sculptures are of young children or of babies with their mothers. Noack was very thin, but with sharp and sparkling eyes. She said she had little want for clothes and fine things, choosing instead to devote herself to sculpture. She mimicked the lifestyle afforded by the workers around her. Many people wondered about the bony woman in plain clothes when she attended art exhibitions and openings around Copenhagen. They were surprised to find that she was a well-regarded sculptor patronised by, among others, the Carlsberg Foundation. In 1937, that institution bought her piece ‘Young Girl’ for 6,000 kroner. From 1940 until 1945, during World War Two, German forces occupied Denmark, and Noack was actively involved in supporting anti-German efforts. She offered shelter and support to young activists in her workshop. If you visit the site of Astrid Noack’s studio today, you can see the sculpture of a kneeling young man holding a flower. This sculpture was modelled on her experience working with the German occupation resistance movement. Astrid Noack died on 26 December 1954 of lung cancer at Øresund Hospital. During her life, she was rarely seen without a hand-rolled cigarette hanging from the side of her mouth. Years of smoking heavily, while living and working in close quarters with wet clay, left her in poor health.